Location: Highest in the Finisterre Range, Papua, New Guinea. Climbed June 25. and again on June 26., 2014. The local people do hope that a small scale ECO-tourism may be established in order for more people to experience the unique nature and culture of this region, as well as being able to climb this fine peak in a somewhat more structured manner. Our ascent established a trail that now connects the mountain with the local village trails. The local people discussed creating a second trail in order to offer two alternative approaches to gain the main ridge in the future. More information about this will follow later. One of the three heads of the "Clans" that are "Landowners" of this mountain, drew small map by hand where this name (Mount Boising) appeared. The other two "landowner" clans are in full agreement. It became clear from my visit over 2 weeks that this name is "widely" used and accepted to mean this peak among about a local population of perhaps 2000 people. 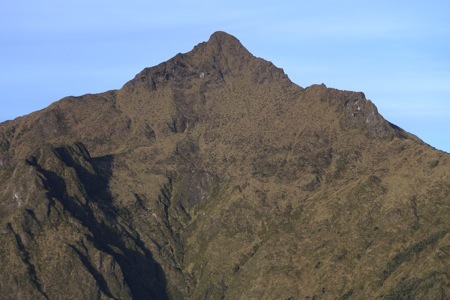 In this context, It is interesting to note that the peak itself is actually visible from the village of Gwarawon, the by far largest village in the Nankina tribe area. Thus, the need for a name is pretty obvious. The name is supposed to mean "stop the fight". The legend tells that the (lower) mountains on either side started "a fight". There were earthquakes and landslides, finally Boising decided to stop it all - and everything became again quiet. My best estimate based on measurements on 2 different days, is (conservatively) that the elevation is 4150 meter. (GPS readings of 4151 and 4155) I would be highly surprised if this is more than 5 meter off. The Garmin itself typically said its accuracy was in the range +/- 3 meter. One should double this to get vertical uncertainty. The Google Map contours are not accurate, they show a rounded summit area. We started at 0820 and we returned to Sapsap around 1700. This trip included a significant amount of time to clear a path through very dense vegatation. We started at 0745, summit at 1245 and reached camp at Sapsap at 1645, a 9 hour effort. This climb was significant, as it broke a TABOO among the natives, that NO woman should even approach this mountain area. The belief was that this would (certainly) lead to her death. The chiefs in two different villages debated this for many hours and finally approved, under several rules that we followed. Barbara has lived in a Papua village as the only white for more than 20 years, she walks around barefoot and is quite well known back down in Gwarawon etc. 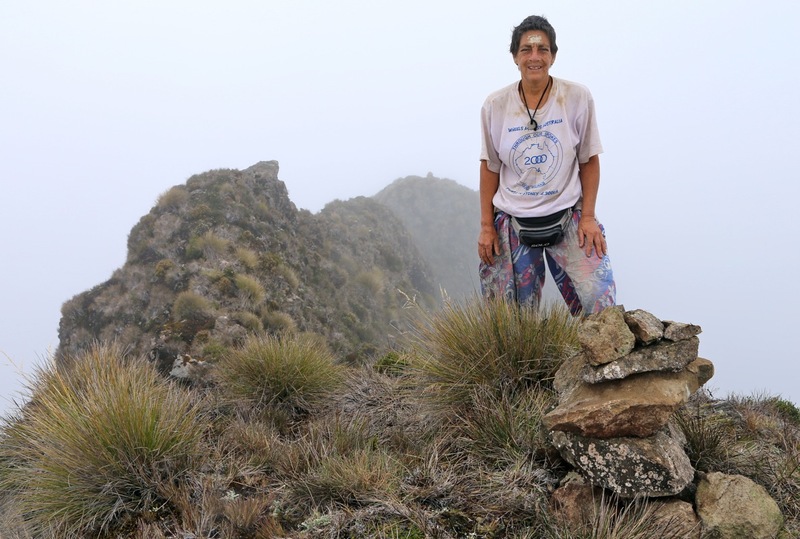 Thus, it was very appropriate that she became the first woman to climb the highest peak in the Finisterre Range. The Finisterre Range is located in Papua, New Guinea. The range separates the coast known as the Rai coast from the Ramu valley. The best point of departure for this mountain is the town of Madang, located across from the Rai coast. International flights from Australia and Singapore serve Port Moresby, the capital of Papua New Guinea (short is PNG), this is the only city with international flights. There are scheduled domestic flights connecting Madang and Port Moresby. Madang has several options for lodging. The high end is Madang Resort, but there are also a few smaller hotels and guesthouses that will provide accommodation. Madang has a supermarket and several banks with ATMs that accept international bank and credit cards. Here is an outline of a 2 week trip. Clearly, some variations are possible and even likely to happen. However, after our initial trip where a substantial effort was breaking/establishing a trail, this trip can now be planned as a two week effort. This schedule assumes that all participants are in good shape and able to walk on difficult trails for full days. Day 1. - Take a dinghy from Madang to Saidor. Day 2. - Walk from Saidor to Yongem. Day 3. - Walk from Yongem to Gwarawon. Day 4. - Walk from Gwarawon to Kwombwu. Day 5. - Walk from Kwombwu to Ganzewit, on the main ridge. Day 6. - Walk from Ganzewit to high camp at Sapsap. Day 7. - Climb Mount Boising, return to Sapsap. Day 8. - Return to hut (Kuruka garden) above Kwombwu. Day 9. - Short day to Kwombwu. Day 10. - Walk from Kwombwu to Gwarawon. Day 11. - Rest day (or reserve day) in Gwarawon. Day 12. - Walk from Gwarawon to Yongem. Day 13. - Walk from Yongem to Saidor. Day 14. - Take dinghy from Saidor to Madang. This schedule has one full reserve day (day 11) that may be used to handle unforseen complications. Rough sea may delay the crossing of the bay with the dinghy, really bad weather could postpone the summit day etc. In addition, the schedule as outlined contains a bit more flexibility. If one arrives by noon in Saidor, one may walk up to the village Wesan that day and possibly (strong party) reach Gwarawon the next day. Similarly, one may descend all the way from Sapsap to Kwombwu in one long day. A one week trip is also possible, provided that one is able to charter a dependable flight (small airplane) round-trip from Madang to Gwarawon. My experience with two such airlines, MAF (Missonary Aviation Fellows) and SIL (Summer Institute of Linguistics), is rather negative. They are not (as of 2014) professional. They do not stand by agreements and may fail to honor definite plans on short notice. (Read about this in my trip report.) The price for a charter flight is also at least twice as expensive as a similar bush charter in for example Alaska. This situation may possibly improve in the future. 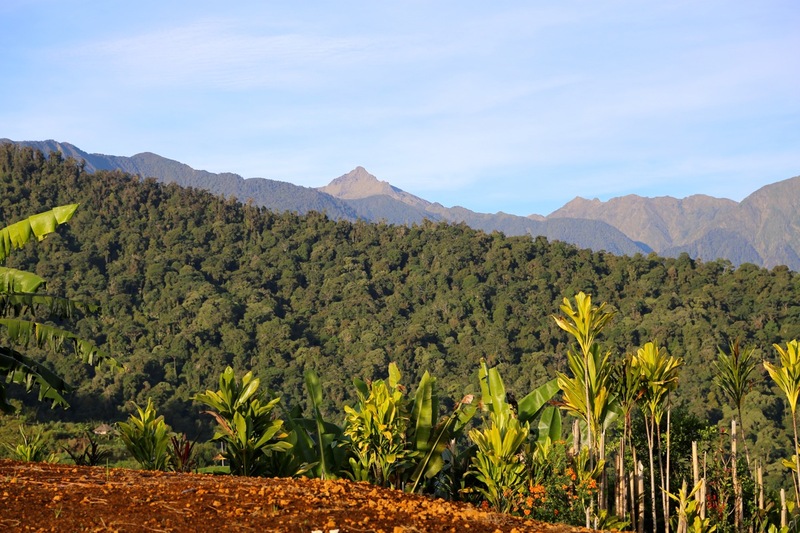 Still, it should be noted that there is a lot of quality in actually hiking from the very coast with coconut palms and a sandy beach, all the way across the different vegatation zones to a 4000 meter peak. This way, one gets to experience the trails that the native population has walked for centuries, one sees and sleeps in the small local villages and learns a lot about both nature and people, highly recommended! This peak was known to be the only unclimbed peak on the list of the 50 most prominent mountains in the world. Very little information existed, the name was not known outside the Nankina tribe. The peak was just known as the highest point in the Finisterre Range. 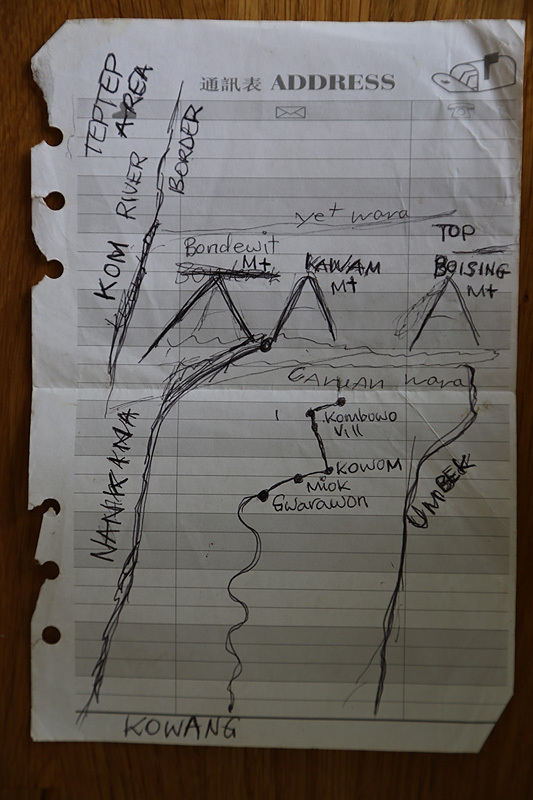 My son Pål Jørgen and I first tried to climb this peak in June 2012. We failed to reach our goal for a number of different reasons, but gained a lot of valuable experience. Trip reports describing our 2012 journey as well as the successful expedition in 2014 will be available towards the end of 2014.. 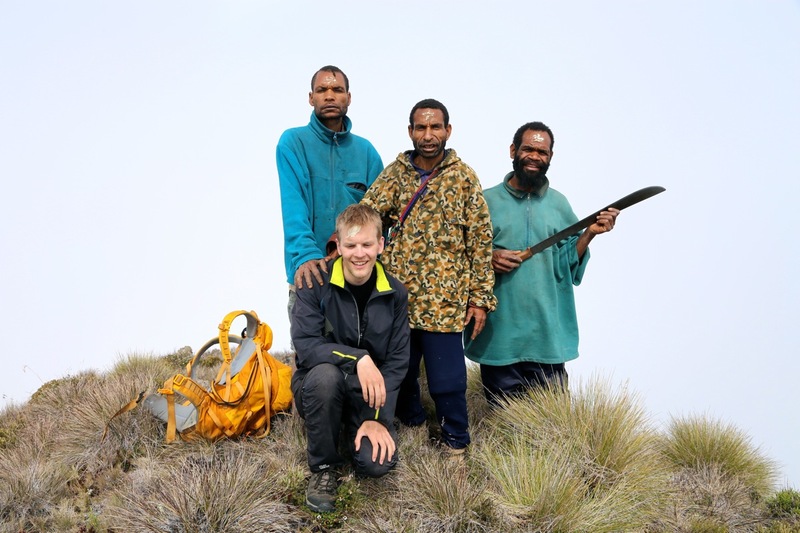 Summit picture, Left to right: Roinu Roipo, Wionare Mitimu, Nathan Hone, Pål Jørgen Bjørstad (in front). 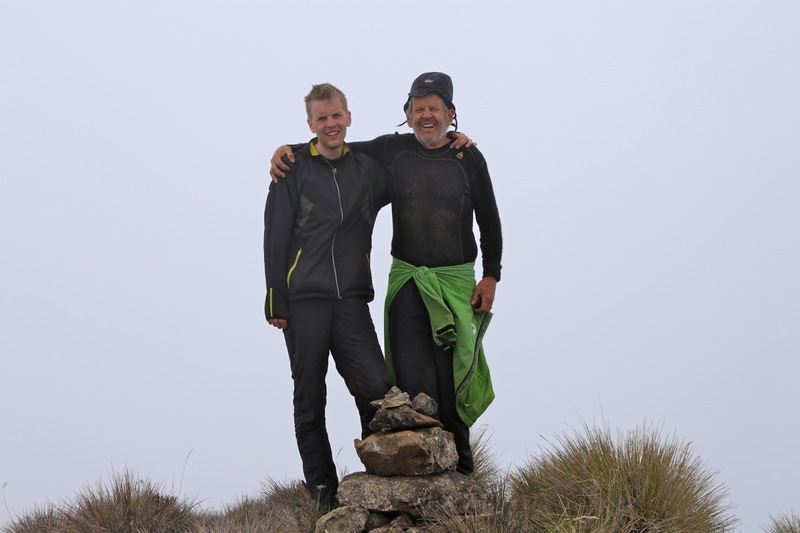 Summit picture, Pål Jørgen Bjørstad and Petter Erling Bjørstad. Barbara Hodgkinson, on the summit. This picture also shows the top summit ridge rather well. We built the small cairn that can be seen at the very end. Mount Boising, as seen from Gwarawon. Mount Boising, as seen on our trip in 2012.